Terrific conditions, but the fishing was sparse. 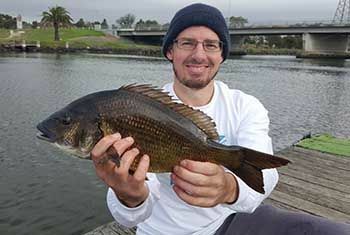 The first hour managed 1 x 34 cm Bream which put up a really good fight, Jeremy managed a nice 26cm Pinkie. The fishing then went cold, the next hour producing a couple of small pinkies and mullet. We were discussing moving to another location when my rod finally got a decent bite (I knew it was a big size Bream as it was taking a lot of line from the spool), after a decent battle I landed my personal best Bream measuring a 42cm monster.